My colleagues at the always outstanding Maple Leaf Hot Stove site reached out to me this week, asking if I might pen a few thoughts about longtime Maple Leaf Johnny Bower, who passed away this week at the age of 93. I don’t post here much any more (though the current Leaf squad is worth writing about, for sure), but I’m always happy to share some old-time memories about the Leafs and the players who helped to build the team’s legacy. Bower was certainly was of those individuals. As I note in the piece for MLHS, Bower may well be the ultimate Leaf. I say this in the sense that he was a battler, such a fierce competitor, and such a fine goaltender. He was the backbone of those four championship teams in the 1960s—including the last one in 1967, which was won against all odds (and facilitated by the brilliance of then teammate Terry Sawchuk, who was magnificent often enough in both playoff series to ensure victory for the Leafs). 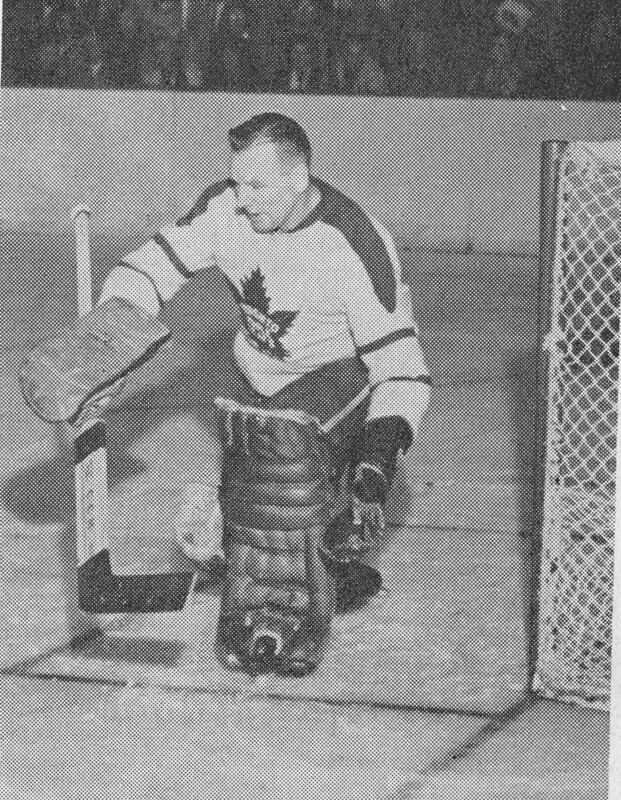 Even though Johnny only played in four games that spring, he was so good in Games 2 and 3 against Montreal in the finals that we can fairly say the Leafs would never have had a chance to win the Cup were it not for Bower, before he was injured and unable to continue playing. Bower was a proud but humble Maple Leaf, who raised the bar for others in the organization so high that I doubt any individual can surpass what he has left behind on or off the ice. Bower was not necessarily born to be a Leaf, it seemed, as he started his belated NHL career in his 30s with the New York Rangers and didn’t establish himself as an NHL regular until the late 1950s under coach and General Manager Punch Imlach in Toronto. Yet Bower went on to become the most popular Leaf player in the history of the great franchise built by Conn Smythe in the 1930s. Bower, like so many of his teammates of the 1950s and ‘60s, played a huge part in ensuring the everlasting popularity of the blue and white. Some will argue that Glenn Hall, Jacques Plante and Terry Sawchuk may have been better netminders in that era. I always loved Hall, and Plante and Sawchuk were indeed remarkably gifted goaltenders as well. To me, they were all great and were all worthy Hall-of-Famers. But Johnny Bower was ours. Through the wins, the championships and the heartbreaking losses (there were a lot of those, too), Bower always seemed to stand tall and represent what was best about being a Maple Leaf- on the ice, and until the day he died. The appreciation that so many people have for him was in direct proportion to what he was as an individual: a kind and generous man, who treated people with respect. As I mentioned in the article, it was never at Johnny. It was about the team, the Leafs and the community. He really was the ultimate Leaf. Thank you for sharing such a fitting tribute to a man of such fine stature, who lived a life of gratitude that was evident to all who ever saw or heard him. The twinkle in his eye and his generous spirit are a legacy for all who knew they would like him and for those who knew and felt honoured to know him. I was quite sure we would see a post from you when I heard the news and can think of few others with whom I would like to celebrate the man and life well-lived. I'm glad you got to enjoy all those games from the 60's with the China Wall in net. Thank you for reviving the perfect place to share in his memory, Michael. Belated Merry Christmas and best wishes for the New Year that is soon approaching. Thank you for your kind comments and your thoughtful reflections on Bower, InTimefor62. 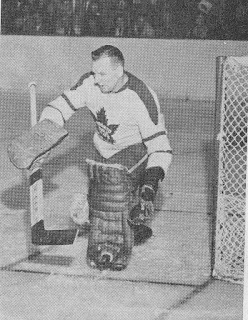 There simply isn't anyone who was more a "Maple Leaf" and well represented the franchise's history and heritage than Johnny Bower. Belated Merry Christmas wishes to you as well. Happy New Year Michael. I too suspected you would post about Johnny Bower, and I was happy to see it here. For me, of course, Bower's was a career that happened before my time. I began my journey as a fan just as Mike Palmateer was being shown the door. I was treated to the likes of Jiri Crha, Alan Bester, and Tim Berhardt as I cheered for the hapless team of the 80s. As I grew up and began to learn more about the team history, I came upon this remarkable story. This kid who lied about his age to join the service and serve in World War II. The close to middle aged man who finally got his chance in his mid-30s to make the jump to the NHL. Then, not content to stand at the top of the mountain for a moment and take it in, he went on for more than a decade there, finishing off an improbable Hall of Fame career. Finally, in my lifetime, the ultimate ambassador for the Leafs, for hockey, for Canada, for humankind, this guy who lived the dream spent the remainder of a long life sharing that dream with us all. Always gracious, always accommodating, always letting us fans feel a part of the dream we all grew up with in some way. They say it is not a tragedy for a man in his 90s to pass away, but Johnny Bower is one person you wish could live forever. Of course, he will live forever, in the mark he made on this planet. Thank you Johnny Bower, for all the memories. So well said- thanks Pete. And Happy New Year to you as well. Please keep posting uncle Mike ! !